Asklipio Epidaurus: Where were miracles.. The Ithmoniki from Pellini slept in the sanctuary of Asclepius asking God to become pregnant. Asclepius told her, that she will fulfill her desire, she thanked him and leaving was indeed pregnant. Someone had stomach ulcers. In his dream he saw inside the sacrosanct that God appeared and ordered the servants who accompanied him to catch him and left him awestruck and tie. After Asclepius tore his belly, took out the ulcer and sewed. Automatically shackles patient solved. The morning went well and the floor was full of impassable bloods. Is it for an early surgery of the servants of God, priests say? In his speech entitled Epidaurus: Place care of body and soul given Thursday night at Music Hall Professor Vassilios Lamprinoudakis not only recounted examples of healing patients through the process of prolonged slumbers in Asklepieion of Epidaurus, the most famous in throughout the ancient world, but apart from the presentation of the Ageless suspense and action for human health and talked about the history of their own monuments. The healer Asclepius in Epidaurus sprang from the ancient cult of heroic ancestors, which in time surrounded divine power, so that in the early 1st BC Millennium to give way to a patron Apollo area, the Apollo Malo, Apollo Maleata as Mr Lamprinoudakis starting the story from the beginning. The findings even _diploi axes, swords, stone rhyta, devotional ie vases in the shape of a funnel for libations, seals, numerous figurines and alla_ show that the importance of worship? Greatly exceeded local boundaries. The ashes of the altar also found filled with animal bones and broken glasses and many other offerings clearly demonstrate the ritual of worship, characterized by dinner at sacrifice. Towards the end of the 7th BC century when the cult was transplanted from Kynortio where it was originally, the great plain where it stands today, the search for divine assistance for health from the principle expressed in the new sanctuary through two parallel and complementary processes. The first was the traditional transferred from the site of Apollo Male, namely the sacrament of divine food accompanied by a process which took place in a mysterious building with several stages in the center of the sanctuary. The other was the prolonged slumbers. The eminently religious, therapeutic operations associated particularly with Asclepius. For prolonged slumbers created the 4th century a large gallery in the east-storey and two-storey-KO dyti in the place where the ground descended steeply. Epidaurus was called enkoimeterion or Avaton. That place where no one goes without divine permission. The patient visited the temple of God, where priestesses sang the paean and went into the Holy Grail, the single-storey place where mentally preparing to sleep and see the dream of the god. As Mr. Lamprinoudakis "In preparation helped by autosuggestion provoking, and reading the numerous miracles of God which were written on large columns into impassable. When the patient was ready - seeker of God, called himself - after making a nightly sacrifice, descended to the ground floor - actually underground - the Holy Grail and slept on the ground, on the skin of the animal sacrificed dusk. In his dream he is visited by God and healed either with his hands or give him any medication or simply tell him what needs to be done cameos for good. Sometimes again assume the role of a sacred animal, usually a snake. " Not even failed to note that this rich experience gained by the desperate invocation of sulfur treatment created real medical knowledge. "And although Epidaurus was the end oriented sulfur doctor from 2nd BC century families know doctors who practiced at Epidaurus medicine outside the sanctuary. At the beginning of the road from the city of Epidaurus to the sacred tomb excavated a family of doctors. Kept intact his chamber, with three sarcophagi inside, with the dead and medical tools, "as he said. 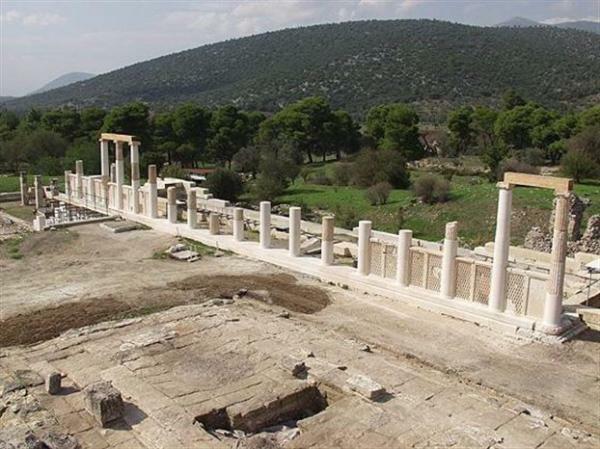 Particular mention was made also the speaker for the theater of ancient Epidaurus created to host ceremonies and religious activities, music, singing and drama competitions, which were part of the cult and culture of the tool of the mind and soul. Besides these forms of worship and mental culture had developed Asklipio long before the construction of the theater, witness the mention of Plato, who says that already the 5th BC century struggles celebrated bards and musicians. Director of excavations of the Archaeological Society at the sanctuary of Apollo Maleata since 1974 and mainly president since 1984, the Committee for the Conservation of Monuments of Epidaurus Ministry of Culture Mr. Lamaprinoudakis can not fail to mention the process of conservation and enhancement of monuments Epidaurus and two shrines, projects that have actually led to a radical change of character of the site.